A contemporary image of grenadiers of the 47th and 48th Regiments of Foot. 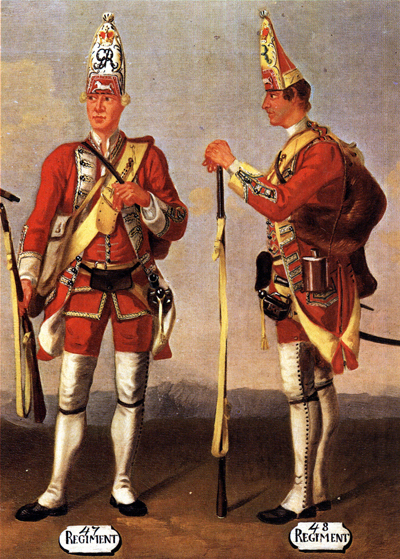 Grenadier companies were first formed in the British Army in 1678, and were not finally abolished until 1855. By the time of the Quebec campaign, the 13 companies of a British foot battalion included one of grenadiers and one of light infantry. The grenadiers, as the battalion elite, were traditionally posted on the right (with the light infantry deployed on the left), though it became common practice to detach an army’s grenadiers and form them into improvised battalions of shocktroops. Wolfe used his grenadiers in this way for the abortive attack on Beauport on 31 July – and felt compelled to reprimand them subsequently for their impetuosity. Grenadiers had their origins in the particular demands of 17th-century siege warfare. They made their first appearance in France, in the armies of Louis XIV, and their original role was to act as leading assault-troops in attacks on enemy ramparts. They would lob their grenades overhead and then storm the enemy embrasures. Grenades – from the Spanish granada, meaning ‘pomegranate’ – consisted of small iron shells of one or two inches diameter, filled with black powder. Wolfe’s grenadiers carried their grenades in large black-leather pouches. These were suspended on the right hip from a wide buff-leather cross-belt, worn over the left shoulder and buckled at the front. Above the buckle was a brass match-case, with a chain to hold the slow match needed to light the fuse. Grenadiers also carried the standard infantry equipment of musket, bayonet, and ammunition (the latter carried in a black pouch suspended at the front from a black waist-belt). To make it easier for grenadiers to sling their muskets on their backs and also to swing their right arm when throwing a grenade, the broadbrimmed tricorne hats worn by most infantry were replaced by distinctive mitre caps of embroidered cloth. Grenadiers were selected for size and strength – not least because larger men could throw grenades further – and their mitres served to enhance their stature. The elaborate embroidery on these, and the rich facings and fittings on their tunics, gave sartorial expression to the high status of these soldiers. The changing nature of warfare in the first half of the 18th century – from static wars of position dominated by sieges to more fluid wars of manoeuvre in which armies fought open pitched battles – meant that the grenade was becoming obsolete by Wolfe’s time. Increasingly, the grenadiers abandoned their eponymous weapon in favour of reliance on the musket and bayonet. But they retained their character as a military elite, continuing to be selected for size and courage, and they were repeatedly used to spearhead assaults.